But this year, things are different. Adam Sandler has given us part 4 of the much acclaimed Hanukkah song and we are introducing Hanukkah, Christmas style (because…well, Christmas is more popular and, when necessary, we are not above giving into peer pressure…also South Park has taken a backseat since Book Of Mormon won a Tony and what’s a Hanukkah song without a Hanukkah poem). On our lawn was a clatter, a bang, and a beep. I wondered what caused such a bang beep and clatter. But Judah the Maccabee with his helmet and spear. Come John, Come Simon, Jonathan, and Eleazar. The story that beckons this Festival of Light. So to war we did go for a full three years time. But only one jug could be found amongst the turmoil. But for eight whole days, their light did not dim. Until the flames of eight candles flicker and flit. And thus he concluded the Hanukkah story. 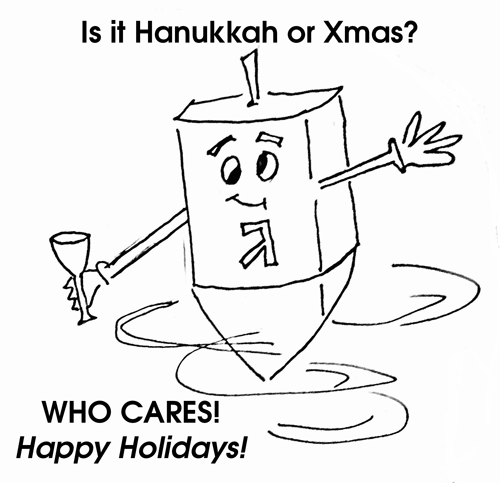 Happy Hanukkah to all, and to all a good night.